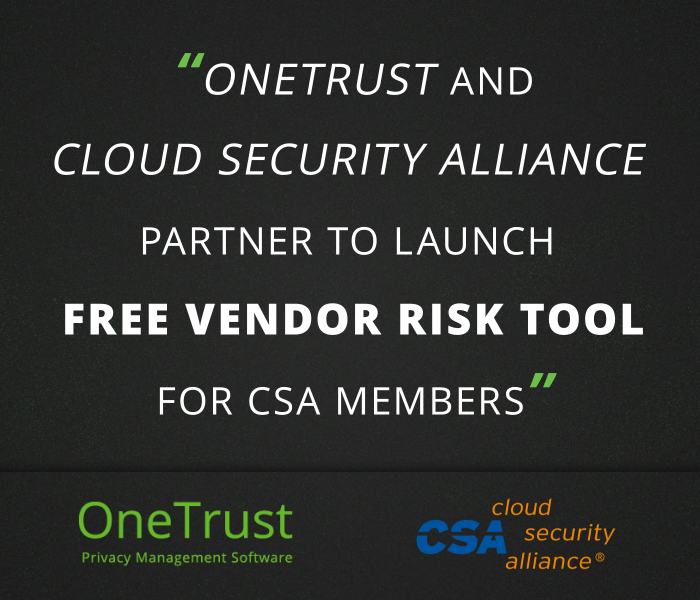 OneTrust is excited to announce that we have partnered with Cloud Security Alliance (CSA) to launch a free Vendor Risk Management (VRM) tool. The tool, available to CSA members today, automates the vendor risk lifecycle for compliance with the GDPR, CCPA and other global privacy frameworks. As the world’s leading organization dedicated to defining and raising awareness of best practices to help ensure a secure cloud computing environment, CSA has 90,000 individual members, 80 chapters globally and 400 corporate members. CSA members can access the VRM tool today and automate vendor risk management at no cost. The CSA-OneTrust VRM tool is pre-populated with the CSA CAIQ framework, self-assessment attestation capabilities using the updated CSA GDPR Code of Conduct (CoC) and built-in CSA Common Controls Matrix (CCM). Privacy and security teams can also build upon existing templates or create custom vendor assessments based on their business-specific needs. The tool is powered by Vendorpedia™ by OneTrust, a database of privacy and security details of more than 4,000 vendors that automatically populates vendor assessments based on the most up-to-date vendor information. Our goal is to provide privacy and security professionals the power to automate and simplify what can be an overwhelming task of managing and monitoring vendor risk. We’re proud to work alongside leaders in the industry like CSA and look forward to providing vendor risk assessment and compliance automation for its more than 90,000 members.